In the battle of guns vs. thoughts and prayers, guns are winning in a rout. In Las Vegas, the guns won, and it looks like they’re going to keep on winning. Jon Dimaya and family attend a candlelight vigil at Las Vegas City Hall on Monday. LAS VEGAS—In the wake of Sunday’s massacre, a series of images loom across Las Vegas as profound reminders of where this country stands on gun violence, and how total a rout one side has achieved in that debate. Driving into the city on I-15 North, passing the towering Mandalay Bay—the site of the attack that claimed the lives of at least 59 people and wounded more than 500—I pass a massive billboard depicting a beautiful woman in a tank top. She’s holding a long gun. It is an advertisement for a firing range that promises on its website the opportunity to “shoot fully automatic weapons in Las Vegas.” The city is replete with such opportunities. On Monday, the same note was plastered on hotel marquees throughout the city: “Pray for Vegas.” In the battle against assault weapons in America, prayer has beaten gun control, and it’s not even close. Brian, who declined to give his last name, told me he’d been a Marine for eight years, doing “anti-piracy operations and counterinsurgency stuff,” and a police officer in Central Ohio for five years. He patiently and knowledgeably explained why he believes the current regulations on “gun suppressors”—that is, silencers—are too onerous, and why the legislation to loosen those restrictions needs to pass. Even so, he acknowledged that the types of guns used in Sunday’s attack—reportedly semi-automatic weapons that had been modified to fire essentially as automatics—serve no practical purpose. “I was in the Marine Corps […] and we used them on our helicopters,” he told me. “But as small arms, something you would carry, we never used it. It’s used for suppressing fire, that’s all it’s used for. On the road from Mandalay Bay to Las Vegas City Hall, the site of a prayer vigil on Monday evening, there was a set of signs for the Vegas Machine Gun Experience. At that vigil, the notion that such instruments of mass death might have had something to do with Sunday’s massacre was not a subject of conversation. Instead, speakers focused on the unifying power of prayer. “We ask you, Lord, at a time like this, at a time of such tragedy, that you will help every one of us to look deep within and to no longer make it about us, but to make it about you and about one another,” said one clergyman. “There’s no words that we can say except to cry out to God,” said another. There are indeed no words if the only appropriate ones are verboten. Such words would contemplate how and why we live in a society where a man like the Vegas shooter has access to these kinds of weapons. But heaven forbid anyone politicize a tragedy in the first 24 hours. It’s important to realize that those initial 24 hours define the tragedy, how the media talks and thinks about the tragedy, and what the ultimate response to the tragedy might look like. It’s also important to understand that offering prayer as the answer to mass shootings is itself a statement of political priorities. It uses the fact that victims deserve the comfort that religion can offer in times of great tragedy to bludgeon everyone—including nonbelievers—with the premise that religion is the only appropriate response to such tragedy. The one speaker who gestured at the fact that the shooter in Sunday’s attack had an arsenal that could outfit a small army was Rep. Dina Titus, the Democrat who represents most of the city of Las Vegas. “We want to thank everybody who has put their heart and soul into trying to grieve today and then after today we will move forward and start talking about why we don’t need one more moment of silence in Congress for victims of gun violence,” she said. 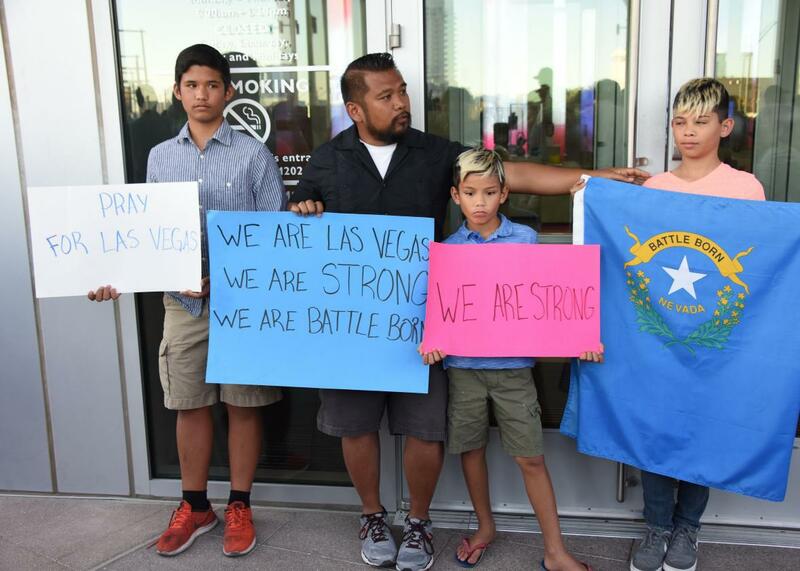 Jon Dimaya was at the vigil with three of his children, holding signs that read “We are Las Vegas, We Are Strong, We Are Battle Born,” “We Are Strong,” and “Pray for Las Vegas.” As a nurse on the rapid response team at Sunrise Hospital and Medical Center—which reportedly treated going on 200 injured people, including more than 100 with gunshot wounds—he witnessed the horror of Sunday’s massacre firsthand. Dimaya described the responses he heard. “I don’t understand what’s going on. I was holding my husband’s hand and I lost him. I don’t know if he’s alive,” said one victim. “This isn’t even my blood. I thought I was shot. I’m in shock right now. This is somebody else’s blood. We couldn’t even tell that it wasn’t mine, there was that much. Somebody fell on top of me. I don’t know what’s going on. That person got shot while he was on top of me and he saved my life,” said another. Dimaya’s wife is also a nurse. She works at St. Rose Dominican hospital, where more than 50 patients were treated. “When she came home in the morning and I came home she looked at me and we just said, ‘What did you see?’ ” he told me. “From there we cried for about a good hour and she said, ‘I [have] to go to sleep.’ And I couldn’t sleep. “I think it’s the person and not the gun,” he told me when I asked him for his thoughts on assault weapons. Dimaya, who said he doesn’t own a gun himself, thought for a moment about whether anything could be done to prevent a shooting like the one at the Mandalay Bay. For the gun lobby, that is what victory sounds like.